1. How long have you been a Cyclist and a Race Promoter in the community? The first race I entered was a cross race in the fall of 2004 but I really started racing in spring of 2005. I began promoting rides in 2009. 2. How did you get into cycling /promoting? Ironically, I got into cycling because of being hit by a car while riding a bike. I was back from college in 2004 and was riding around the neighborhood on my mountain bike to try to get back into shape. I was hit head-on by a driver who turned in front of me while I was descending a hill. I was hospitalized and put in a cast for the summer. I was unable to go back to my job and was just sitting around in July, flipping through the channels, and came across the Tour de France. I watched every minute of that Tour and was hooked. I bought a road bike before I was even out of my cast and hired Richard, my first coach to train me. I went to Lawrence the following March to watch the Spring Fling races and signed up for the next week’s race. I started racing like crazy and upgraded quick, racing 45+ events in those early seasons. I joined up with Mark Thomas and Slimenundgrossen and a few years later did some racing with the Planet X Factory Team. Since then I have raced with Team Colavita/Parisi and now Prologue. I began promoting in 2009 when Chris Pace, myself, and a few other friends founded The Freedom Ride to do some fundraising for cancer charities. I took on BikeMO with the Missouri Bicycle and Pedestrian Federation a couple of years later. From there, I co-promoted a couple of time trials with Gina Poertner and in 2015 I was approached to take over the Tour of Kansas City and with help from a few friends we took on that event. I have been promoting Prologue Cyclocross for a couple of years now as well, again with the support of a core group of people whose help is priceless. 3. What trends have you seen happen in the last 5 years in the cycling community? Since I began racing, cyclocross has clearly outpaced road in growth and participation. That has more recently shifted into an increase in gravel riding and events. Strava was another change that has come along since I began riding that changed, in some ways, the nature of training and riding for many riders. 4. What would you like to see happen in the cycling community? The key to the health and longevity of our cycling community is for us to grow the sport locally, with new cyclists. We need to build the cycling community by actively bringing in new riders, from outside the sport. Increasing the cycling community’s numbers will lead to better participation in all aspects of cycling; recreational riding, commuting, mountain biking, road, gravel and cross. There would be better turnouts at all the events and as a result you would probably see more events. This would also translate to more local teams to compete at events, which would mean better quality racing. This in turn would mean more interest in the sport from sponsors which would mean better quality events. 5. Tell us about your races, how many do you do each year? 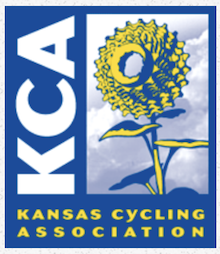 I am involved with Freedom Ride, BikeMO, Jack-Cass Century, Tour of Kansas City, and Prologue Cyclocross. They all raise money for non-profits and charities in some manner. They are all great events in their own ways. 6. Tell us about your family, profession other interests or hobbies? I have three kids, all under 8. I taught elementary school for 10 years before resigning to stay at home with the kids. My wife is a Nurse Practitioner currently working for the University of Missouri Health System. I enjoy all things outdoors and have participated in a wide-range of sports. I enjoy traveling and have been lucky enough to travel to a lot of great places over the years. 7. What are your goals for 2018? I hope to increase my own participation in racing and recreational rides in 2018 and begin getting my race fitness back. We have a team trip on the Natchez Trail in September that we are preparing for and I hope to make it to Jingle Cross and Interbike again this year. We are preparing for a 2019 team trip to bike in Italy next year as well so those plans have already begun. I hope to get out to some rides I have not participated in before and I want to try a mountain bike race this year. 8. What advice can you give to other cyclists, to keep them motivated? You must ride and race because it is something you enjoy doing; any other reason, and it can begin to feel like a job you hate going to. Rest when your body tells you but even more important, rest when your mind tells you. Ride different disciplines, ride with different groups, and mentor those who are new to the sport. 9. Do you have a favorite quote you would like to share? One thing to understand about cycling was put into words very well by Greg Lemond, “It never gets easier, you just get faster”. Another quote that sticks with me came from my first coach Richard Gordon. When he was training me for time trials back in the day, he gave me one of the most succinct pieces of advice for racing a time trial, “Go hard until you feel like you are about to throw-up, hold it right there, and keep going to the finish”. 10. What are the top 3 benefits you have experienced being a cyclist, volunteer, or Race Promoter? The number one benefit from the riding and racing is the friendships that have been built over many miles of riding side-by-side. That is the most important, and lasting, benefit that has come from cycling. Fitness and fun are two of the other benefits I have enjoyed the most.